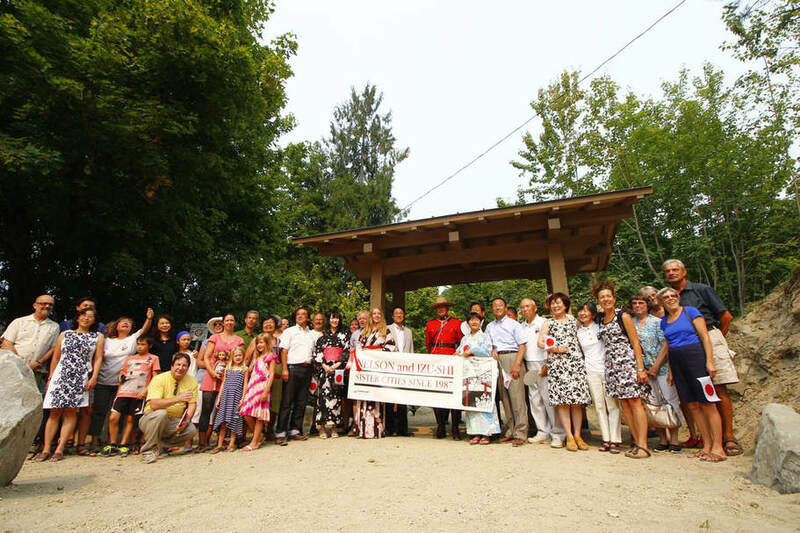 To commemorate the 30th anniversary of the sister-city relationship between Izu-shi (formerly Shuzenji), Japan and Nelson, Canada. To welcome the delegation from Izu-shi, including Mayor Kikuchi, Council Chair Mita, President Suzuki of the Izu-shi Society for Friendship Relations (ISFR), Vice- President Uematsu of ISFR, Izu-shi – ISFR Liaison Atsumi Kurosu, and members of the Izu-shi community. To dedicate the new Friendship Gate, at the west end of the footbridge over Cottonwood Creek, that leads to the Cottonwood Falls Friendship Garden. The montage of photos below showcases some of the entertainers, delegates from Japan, participants from Nelson and citizens from the local region. How many people can you identify? Click to open the webpage. A big thank you to Rachel Greenaway and her son Chaz for taking large numbers of photos of the event, and to Keiko Fitz-Earle for choosing and assembling photos for the Google Photos page.